I was born in Houston and grew up in a devout Muslim home. My dad was very involved in the Iranian Muslim community. When I was 2 years old, my family moved to Iran, where my parents are from. But when I was 6, the Islamic Revolution of the late ’70s hit that country. My father, who was a doctor, had the means to get us out of the country, so we moved back to Houston. Growing up, I was taught the five pillars of Islam and told that if I did them to the best of my ability, then maybe I’d get to Heaven. I spoke Farsi, not English, so God, in His incredible plan, provided a Christian lady who tutored me, teaching me the English language every day by reading books to me. When I was in the second grade, she said, “Afshin, I want to give you the most important book that you’ll ever read in life.” As she handed me a small New Testament, she asked me to promise to hold onto it until I was older. Ten years later, one day as a senior in high school, I used the Lord’s Name in vain while playing basketball. A guy on the court said, “Hey, that Jesus whose Name you just said—He’s my God.” As a Muslim, I’d been taught that Jesus was a prophet, so I thought the guy was nuts. A few days later, while watching TV, I stumbled onto a documentary on the life of Jesus, where I heard, “Some worship Jesus as God, and they’re called Christians.” That afternoon, I found that small New Testament at the bottom of my closet and began to read it. Every day, I’d read under the covers in my bed with a flashlight so my parents wouldn’t see what I was doing. Meanwhile, at my high school, a Christian student sat across the table from me at lunch and told me about Jesus. I’d debate against him each day, and then at night I’d go home to read more about Jesus. One day, I got to the Book of Romans, and the third chapter completely changed my life. I read about a righteousness that comes apart from what I do for God. This righteousness comes as a gift to be received by faith. I was struck by Romans 3:22, which says that this righteousness comes to all who believe. I thought I was born a Muslim and would always be a Muslim, but that verse said that this righteousness was for anyone who believes, of any ethnicity. A couple weeks later, a guy invited me to an evangelistic crusade, where I heard the Gospel proclaimed and came to faith in Christ. The implications of my commitment to Christ hit me on the way home. What am I going to tell my family? What am I going to tell my father? I decided to hide my newfound faith. I would sneak out to church, intercept mail from the church I was attending and keep my Bible hidden. Everything in my flesh wanted to say, “Forget it. I’ll be a Muslim.” I didn’t want to lose the relationship with my dad. So even I was surprised when I said, “Dad, if I have to choose between you and Jesus, then I choose Jesus. If I have to choose between my earthly father and my Heavenly Father, then I choose my Heavenly Father.” My father disowned me on the spot. “Everyone who acknowledges me before men, I also will acknowledge before my Father who is in heaven, but whoever denies me before men, I also will deny before my Father who is in heaven. Do not think that I have come to bring peace to the earth. I have not come to bring peace, but a sword. For I have come to set a man against his father … And a person’s enemies will be those of his own household. Whoever loves father or mother more than me is not worthy of me, and whoever loves son or daughter more than me is not worthy of me. And whoever does not take his cross and follow me is not worthy of me. Whoever finds his life will lose it, and whoever loses his life for my sake will find it” (Matthew 10:32–39). That’s when I first understood what it means to be a follower of Christ. I had to lose my father to follow Christ. But I learned firsthand that when you lose your life, you find it. God gave me a roommate in college who was also a former Muslim and had been disowned by his father. After college, God led me to seminary and eventually to a position as a college pastor. For 15 years I traveled all over the United States, preached the Gospel and saw Muslims come to faith in Christ. I have partnered with a ministry that reaches into Iran with the Gospel, and have had the privilege of training and equipping Iranian pastors, helping to spread the Gospel in the same nation from which my family came. I now pastor a church in Frisco, Texas, where I get to weekly remind people to count the cost of following Christ. I am thrilled to say that my relationship with my dad has been restored, and I continue to pray for his salvation daily. What Has Jesus Cost You? 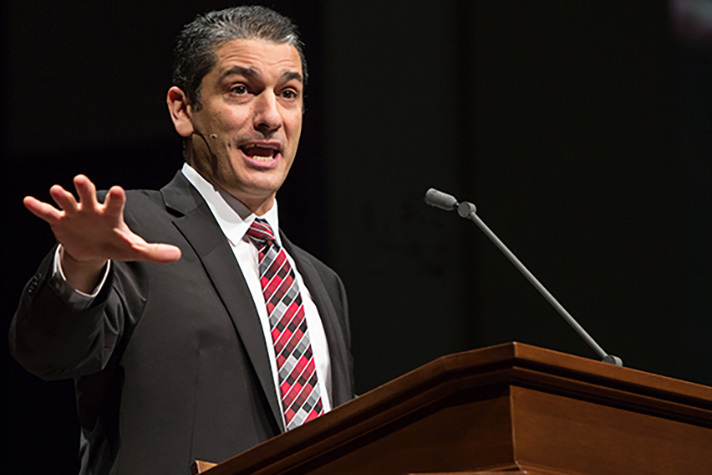 Afshin Ziafat is lead pastor at Providence Church, Frisco, Texas. He serves on the board of directors for East-West Ministries in Plano, Texas, and for Vertical Ministries at Baylor University in Waco, Texas. Do you know Jesus as your Savior and Lord? Start a relationship with Him today.